Serpent soldiers are tall soldiers, half man, half serpent, equipped with a huge sword and a wooden shield. They either attack with their sword or try to bite the player. 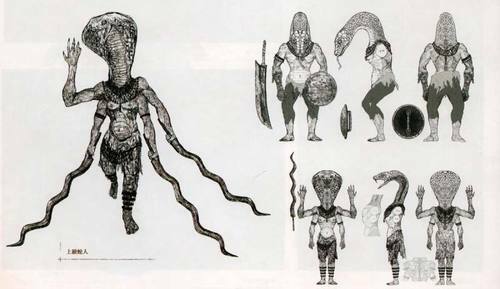 The serpent mage is half man, half cobra, with four arms quad-wielding spiral swords, they attack with melee and ranged lightning attacks. 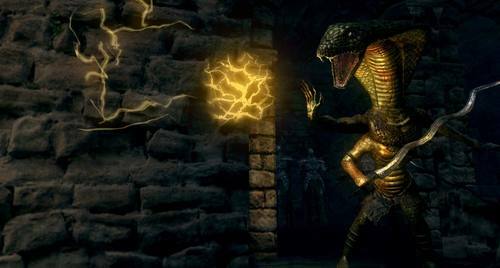 The serpent men are the jailers in The Duke's Archives, and are also found in Sen's Fortress. Both places seem to have several cells where they could lock up their captives. The Cage Key description explains that the serpent men imprison hapless adventurers but do not not kill them. 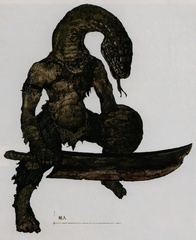 “Eventually, unless they have forgotten, they drag the victim off to who-knows-where.” Considering they guard the prisoners in the Duke's Archives where Seath experimented on them, it is possible that these serpent men also transport captives to the prison there. the serpent men will not kill him, but lock him up in a lonely cage. Eventually, unless they have forgotten, they drag the victim off to who-knows-where. Key to the cell of the Duke's Archive Tower. The Archive Tower, once a trove of precious tomes and letters, became a prison after the onset of Seath's madness. The serpent men who guard the prison know not the value of what they hide. In the basement of the tower are the writhing "mistakes" of the terrifying experiments which were conducted there.